Understanding The Basics of Ohm's Law - both AC and DC Charts....what's the difference? If you need to deal with Voltage, Current, Resistance or Impedance, and Power formulas, and you want to know what the differences are between what we call AC and DC formulas, you may find these Ohm's Law Power Wheels useful. 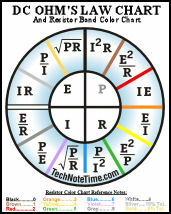 The four quadrant form simplifies the process of finding the values of E, I, R or Z, and P. There are two wheels, one for our DC Ohms law chart (R - Resistance Formulas) and one Ohms law chart for our AC (Z - Impedance Formulas). If you're curious about the color on the wheel, we use those as a handy reference for resistor band colors...we include these on our Ohm's law watches and clocks. Please read on for more information on how to read that chart. The two main types of electricity are alternating current, known as AC, and direct current, known as DC. The difference between alternating current and direct current systems is in how the power moves through the lines. With an alternating current the flow of power reverses direction - actually 60 times per second, but with a direct current, the power will only move in one direction. Ohm's law and Joule's Law power formulas. Generally, if you are an electrician, technician, journeyman, apprentice, student or hobbyist you may prefer this Ohms law wheel product. Think resistance - need R formulas? As you advance in your training you will, no doubt, find the AC formulas for impedance (chart above) handy also. 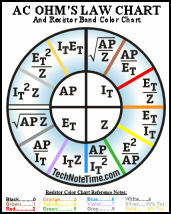 TECHNOTE: To use the chart, from the center circle, select the value you need to find; for example on the DC chart, I (Amps), R (Ohms), E (Volts) or P (Watts). Then select the formula containing the values you know from the corresponding chart quadrant. These Ohm's law power wheels above show our resistor band color chart which will help you with identifying resistor colors...it's a unique concept and you'll find it fully explained on our TechNotes Page to the left. We include these charts on all our Ohm's law watches, decals, keychains, charts and clocks, so don't forget to take a peek at "Our Products" page before you leave our site. Thanks! The concepts (theory) of voltage, current, resistance, impedance, and power are essential to understanding basic electrical circuits and specifications. These areas must be perfectly understood before one can grasp the innards of even the most basic electronic gadgets such as cheap mobile phones. Once those concepts feel familiar, you'll find making the proper connections between pieces of equipment much easier. You'll also be able to make more sense of manufacturer specifications, which should help you make better purchasing decisions. Ohm's Laws is one of the fundamental laws of physics. Current flow in a circuit increases as the voltage is increased, and decreases as the resistance is increased OR the current flowing in a circuit is directly proportional to the voltage applied to the circuit, and inversely proportional to the resistance of the circuit. The theory of Ohm's law can be stated as a mathematical tool which is of the greatest use in determining an unknown factor of current, voltage, or resistance in an electric circuit in which the other two factors are known. It can, therefore, be used to take the place of an ammeter, voltmeter, or ohmmeter -- when you are trying to resolve a circuit value in which you already know the two other values. There are two types of current: direct and alternating. Direct current (DC) flows steadily in one direction through a conductor; alternating current (AC) changes direction in the conductor at various frequencies. For an example of this please go to our TechNotes page. In virtually all electrical circuits, there is some opposition to the flow of current. The opposition to direct current is called resistance which is measured in units called ohms, and it is represented in electrical equations by the letter R.
The opposition to alternating current is called impedance which is also measured in ohms, but it's represented in electrical equations by the letter Z. The letter P equals power in watts. TECHNOTE: It was James Prescott Joule, not Georg Simon Ohm, who first discovered the mathematical relationship between power dissipation and current through a resistance. This discovery, published in 1841, is properly known as Joule's Law. However, these power equations are so commonly associated with the Ohm's Law equations relating voltage, current, and resistance (E=IR ; I=E/R ; and R=E/I) that they are frequently credited to Ohm. TECHNOTE: Kirchhoff's laws... n : (physics) two laws governing electric networks in which steady currents flow: the sum of all the currents at a point is zero and the sum of the voltage gains and drops around any closed circuit is zero. Please check out our other categories while you're at our website. We offer products in addition to content! Products such as Ohm's law watches, clocks, charts, decals and Ohm's law coins! We offer other electrician's and engineer's gifts such as window decals, funny full color decals, posters, mugs, jewelry, greeting cards, etc. Just click on any of our gift departments to the left. Thank you!